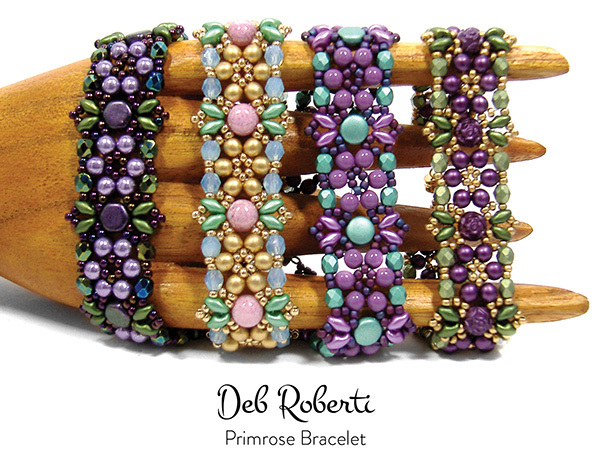 Use size 11/0 seed beads, 4mm round beads (druks or glass pearls), 4mm fire-polished beads, SuperDuo beads and 6x6mm two-hole round beads (6mm cabochon beads, Honeycomb beads, Rosetta cabochons or DiscDuo beads) to creative this pretty Spring-ready bracelet. As always, full step-by-step instructions with illustrations included. Note: 7mm Czechmates cabochons and 7mm Baroque cabochons are too big and sadly, will not work for this design. 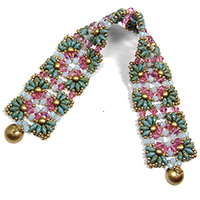 Beads Used: Size 11 seed beads, 4mm round beads (druks or glass pearls), 4mm fire-polished beads, SuperDuo beads and 6x6mm two-hole round beads (6mm cabochon beads, Honeycomb beads, Rosetta cabochons or DiscDuo beads). Again, 7mm Czechmates cabochons and 7mm Baroque cabochons will not work for this design.